Bishop Seitz statement on the current refugee situation. 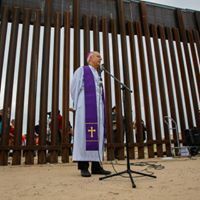 We here at the Catholic Diocese of El Paso are very concerned about the hundreds of people being put on the streets in El Paso at the bus depot, at the airport and at a local park.. We understand that the facilities of Homeland Security are overcrowded but the decision of our government to simply put these children and families with no money, no tickets, no food, no access to phones, out on the street, is inhumane and unconscionable. In the Church in cooperation with Annunciation House we are doing our best to house as many as we can and we have been receiving 300-400 a day depending upon volunteer efforts and whatever resources we have. We have sent out messages to all our parishes asking them to make available more volunteers and facilities. Our government has a responsibility when it takes these refugees into custody to provide for their basic needs. We do as much for death row inmates. With the recent deaths of two young children, the accounts of mistreatment in holding cells and the heartless expulsion of these families an undeniable picture is coming into focus and it is not one of which we Americans can be proud. Families from Central America are fleeing to our country because it presents the only hope to escape the endemic violence and hunger they are facing. Who among us if faced with similar circumstances would not do the same for our family? But instead of helping to improve the situation in their home country, a situation which our nation has contributed to in many ways, especially by our affection for illegal drugs, we mistreat those who seek refuge here so badly that it is hoped others will not come. The truth is they are running for their lives. They will take whatever risks necessary. Meanwhile we who are citizens of this most wealthy nation in the world are going to have to deal with the consequences of our hardened hearts. Clearly this Christmas the newborn Savior will find no room. I was very disappointed to hear of plans to open a large Planned Parenthood Abortion facility in El Paso. With their presence in our border region our children in the womb will be facing a new and menacing threat to their existence. Planned Parenthood will say that it is going to offer a wide range of health services to women but the truth is that as former Planned Parenthood Clinic Director, Abby Johnson has pointed out, all that they do is geared toward their primary money-making operation which is aborting children. Planned Parenthood performs close to one out of every three abortions that take place in our country, over 320,000 every year. Planned Parenthood performs 160 abortions for every one mother that is referred to adoption. The related services which they do offer should concern especially parents from our region as Planned Parenthood will enter our schools and teach our children from a young age a morality that is contrary to that held by the majority of our families. Planned Parenthood claims they will check for and help curb STD’s, but the approach to sexual activity outside of marriage that they promote increases the proliferation of STD’s, which is presently at epidemic proportions among our youth. Although they claim to provide many other women’s health services they do not offer mammograms and they perform less than 2% of all women’s cancer screenings in the U.S.
We in the Catholic Church and many of our brothers and sisters of other churches stand ready to provide a true choice to mothers who feel that abortion is their only choice. We are ready to provide the support they need so that they may give birth to a baby boy or girl. Abortion is not a solution. It is violence against the most vulnerable and innocent human beings. Abortion leaves physical and emotional scars on women and men involved that may never heal. Every life matters, from the child in the womb until death and everything in between. The life of a child takes precedent over any choice. In El Paso, women’s comprehensive health needs are better served by our existing community health centers. The border wall is treating a symptom and not a cause. It is a symbol of a failure on the part of our country to resolve the issues that could be dealt with by a comprehensive immigration reform. It is a response to our affluent nation’s unwillingness to love our neighbor—neighbor countries and our neighbor, the immigrant and asylum seeker. It is a sign of our broken relationship with God. This reinforced wall will heal no wounds; solve no problems, but stand as a further scar on our land dividing our families, our cities and our nations. El Paso Screening on Monday August 6 at 7p & 7:45p at Alamo Draft House in Monticello. With rare footage from some of the most remote reaches of the U.S., “The Wall” explores the impact, reveals unknown issues and details the unintended consequences of President Trump’s $20 billion promise to build a wall from the Gulf to the Pacific. El Paso Bishop Mark Seitz will be in Attendance. Watch as journalists travel the length of the U.S.-Mexico border – by land and air – documenting the possible effects of a wall on security, life, commerce, the environment, smuggling and property rights. The following statement issued by the United State Catholic Conference of Bishops recognizes that the Catholic Church is “suffering from a crisis of sexual morality.” As a member of the USCCB I, along with my fellow bishops, acknowledge this crisis and pledge further reform. In an effort to ensure reform I ask you, the faithful Catholics in this diocese, to remain vigilant in your efforts to keep our parishes, our schools and our events safe for all people. Thousands of people in our diocese, including you who may be reading this, have been formally trained and certified on sexual misconduct and on maintaining a safe environment for our children, youth and vulnerable adults. Our Safe Environment Training program known as Virtus is made available to and mandatory for all diocesan priests, deacons and lay personnel, especially those who work with minors, parents, children and youth. It is imperative that we, as a community of faith, understand the difference between appropriate and inappropriate behaviors as we learn to recognize abuse and its potential. I want to emphasize that we must always report suspected abuse immediately to the appropriate authorities. We must continue to pray for resolution to this challenge before us. 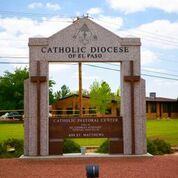 I assure you that in the Diocese of El Paso we will always first care for the victims who have suffered abuse rather than protect our own image. We will always remain a local Catholic church that seeks to earn your trust, guarantees accountability and takes responsibility for our mistakes and failures. Addressing abuse issues in our Church and taking steps necessary to prevent abuse in our diocese requires a collective action and commitment on all our parts. May God help us to be reflective of what Jesus intended His Church to become when he first sent the Holy Spirit upon her. May our Holy, Catholic and Apostolic Church remain the custodian of the teachings of Christ and may that same Holy Spirit move us to be more like him. "The accusations against Archbishop Theodore McCarrick reveal a grievous moral failure within the Church. They cause bishops anger, sadness, and shame; I know they do in me. They compel bishops to ask, as I do, what more could have been done to protect the People of God. Both the abuses themselves, and the fact that they have remained undisclosed for decades, have caused great harm to people's lives and represent grave moral failures of judgement on the part of Church leaders.